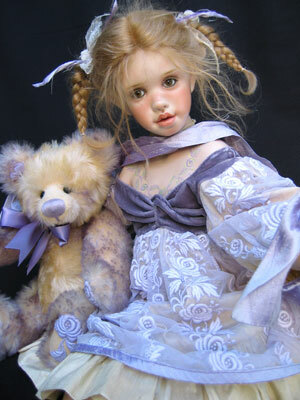 A gentle blond child, her shoulder plate decorated with delicate roses, wears a dress made of vintage, English net lace (roses and leaf design) dyed to blend with her bear. She cuddles up to a beautiful soft yellow bear, his fur tipped with lavender and roses on his paws. This beguiling couple, so soft and gentle will melt your heart.